Nominate outstanding individuals, organizations, and initiatives for recognition! Each year, the AIA Dallas Community Honors Committee celebrates the individuals and groups who are promoting, improving, and expanding our profession. 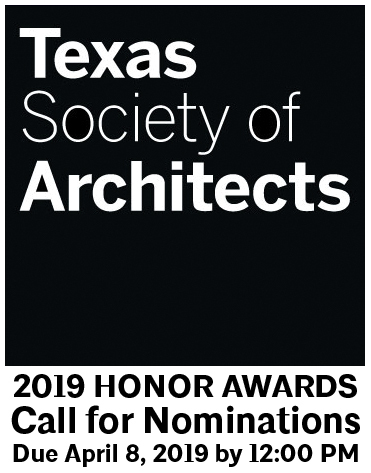 We nominate and create the submission packets for awards given out by Texas Society of Architects (TxA), AIA National, and by our local Chapter. It is a role we take seriously, and we strive to think outside of the box to recognize those who make meaningful impact on our community. The Society’s highest honor, the Medal for Lifetime Achievement is awarded to recognize a TxA member for a lifetime of distinguished leadership and dedication in architecture and the community. Awarded to a member firm that has consistently produced distinguished architecture for at least 10 years, this is the highest honor the Society can bestow upon a firm. The Honor Awards Committee will focus its evaluation on the quality of the firm’s architecture and the firm’s contributions to AIA, the profession, and the community. Firms practicing under the leadership of either a single principal or several principals are eligible for the award. In addition, firms that have been reorganized and whose name has been changed or modified are also eligible, as long as the firm has been in operation for a period of at least 10 years. Awarded to an individual member for an extended commitment to community service or significant contribution evidenced in a positive impact on urban, environmental, or neighborhood issues. Nominees may be architects who use their practice to enhance their community. A nominee must be a current or former member of the faculty at one of the eight accredited Texas schools of architecture, and must have been a full-time educator for at least five years. Criteria includes: teaching of great breadth; influencing a wide range of students; and the ability to maintain relevance through the years by directing students toward the future while drawing on the past. It is expected that a candidate teaching courses in architecture be an AIA member. This award recognizes a member for professional achievement in leadership development during the early years of practice. Architect members of AIA who have been licensed to practice less than 10 years by the submittal deadline, and who are currently registered in the State of Texas, are eligible. The nominee should be a role model who: goes beyond the call of duty in service to the profession; influences improvement in the organization at the state level; encourages participation among fellow members and nonmembers; exemplifies qualities of leadership; and exemplifies qualities of professional practice. This Honor Award is presented to an individual Associate AIA member who best exemplifies the highest qualities of leadership and has demonstrated an unparalleled commitment to Texas or to his or her component chapter. Honorary membership in the Texas Society of Architects is one of the highest honors the Society can bestow upon a person outside the profession of architecture. It is awarded to an individual for his or her long-term association with architects, architecture, or allied professions in providing a better quality of life in Texas. Awarded to a Texas Society of Architects member or a Texas AIA chapter for developing unique programming for the successful development of Associate AIAs, or for an extraordinary effort to mentor and promote the advancement of these professionals at the local or state level. Awarded to recognize an individual or organization for excellence in the promotion of architecture through the media. Media is a broad category and can include written materials, radio/TV, web and digital format. Awarded to groups, organizations, or individuals outside the profession whose activities make significant contributions to the goals of the architectural profession for improvement of the natural or built environment in Texas. If you know a person, firm, or organization that meets the award qualifications above, please let us know. We want to acknowledge these individuals for the incredible work they do and for the strong impact they have. Please click HERE to submit a nomination. Nominations are due by noon Monday, April 8th.